www.dvinewineusa.com Kingsgate North, 4210 82nd Street, Ste 232, don’t know which wineries are its source(s) or which are Texas wineries. Hosts evening music wine and appetizer food events. http://www.dvinewinelubbock.com/tempsite/ phone 806-771-4886 to get on the mailing list for events. Elsewhere in the state there are many winery visitation opportunities. South of Fort Worth at Burleson you will find Lost Oak Winery 2116 FM 731 www.lostoakwinery.com with five acres of cultivated vineyards on the banks of Village Creek. Not far away is Sunset Winery 1535 South Burleson Boulevard www.sunsetwinery.com where Birgit and Bruce are owners and will provide that guided tour that ends in the tasting room. For touring southwest of Fort Worth off US Highway 67 on the road to Stephenville try Barking Rocks Winery in Granbury, Bluff Dale Vineyards in Bluff Dale, and if you drive past Stephenville halfway to Brownwood stop at Brennan Vineyards near Comanche. 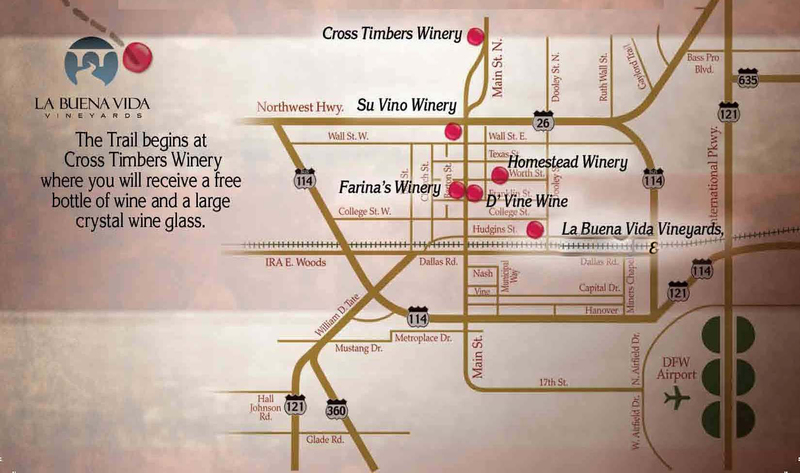 In the Lampasas Texas area there are five wineries nearby, Texas Legato Winery and Pillar Bluff Vineyards at Lampasas, Fiesta Winery in Lometa, Alamosa Wine Cellars near Bend and Wedding Oak Winery in San Saba. etc. etc. etc. If a label says the bottle contains a Texas wine, that means that the bottle has at least 75% of its wine that was made from crushing Texas-grown grapes. In the case of a small winery, Pheasant Ridge, it advertises that all of its wines are made from grapes grown on its own or contracted area vineyards and crushed on site. Thus they are all Texas wines. Many wineries located in Texas purchase grapes from out-of-state and also purchase vat wine made out-of-state with non-Texas grown grapes. The result is that not all wine produced at a Texas winery is Texas wine. Sometimes a blended wine will contain less than 75% wine from Texas-grown grapes, so it’s partially Texas wine but the label won’t say that. Still, some of the blended wines are excellent, expressing the art of the winemaker in knowing what and how much of each wine to blend in order to gain a smooth delicious ultimate wine.